You have to notice that your cell phone has converged with the computer in the last few years. You are no longer talking through the old analog radio. Instead, you are conversing through your network via digital Voice over Internet Protocol (VOIP). Your voice is transmitted in digital data packets through the network before it is recovered as voice on the other side of the network. The entire process is handled through a chain of computers. Your smart phone is now functioning as a computer similar to your PC. It has color screen display, keyboard (physical or touch screen), audio jack as well as file storage system. It is similar to your PC except it is portable and fits in your palm. For the last 10 years, CPU manufacturers have been in a speed race. CPU clock of 1Ghz to 3Ghz is now very common and also inexpensive. As a matter of fact, consumers start to realize that any CPU over 1Ghz speed is sufficient for the normally performed task like surfing the Web, Voice over IP and creating text documents. Power consumption and package size have come into focus as the new requirement. Consumers, instead, want their computer in the palm size, and the battery to last for a full day of operations. Just like the desktop computer, the demand on memory and storage rises as applications become more advanced. My iPhone has a calculator, a book reader, a camera and an email vault. Memory consumption shoots up as the day go by. 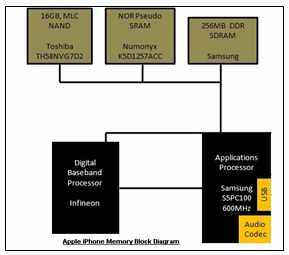 Let’s examine the smart phone memory architecture and its trends. Basically, there are two types of memory. One is to do instant operation and serve the display. The other is mass storage memory to store pictures and media files. For example; frame buffer DRAM memories are needed to quickly bring the Youtube pictures to screen without flickering. Fore email application, it needs quick communication processing and large storage. For the multi-media and camera frantic, long term mass storage is needed. 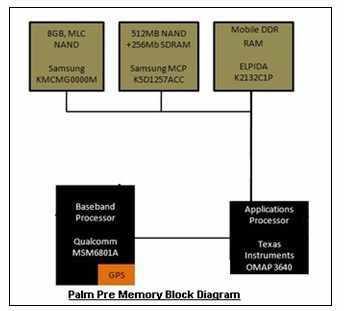 From the cell phone memory architecture diagram above, we can see that the memory system can become quite complex. Different price level machine will take different trade-offs in memory system to achieve their level of performance. For the basic OS and firmware storage, the choices are between NOR, PSRAM and One-NAND. As for video frame and operational scratch pads, choices would fall onto LPDDR (Low Power DDR DRAM). LPDDR is very similar to the DRAMs in your desktop and notebook. They are optimized for low voltage and low power to save battery. Since multi-media storage takes Giga Bytes, it is best for NAND flash systems. Options include Managed NAND, eMMC with plugged-in flash card as well as the upcoming UFS storage card. Next, let’s examine the memory architecture with each of the popular smart phone on the market. The iPhone memory system consists of 3 chips. The 16GB NAND is for storage while the NOR P-SRAM is for firmware. The 256MB of DRAM memory is packaged with the application processor as an MCP (multi-chip package) to save space. 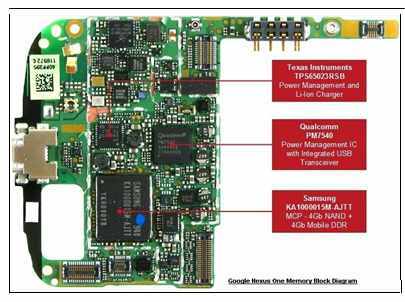 The Google Nexus One memory system is more interesting. 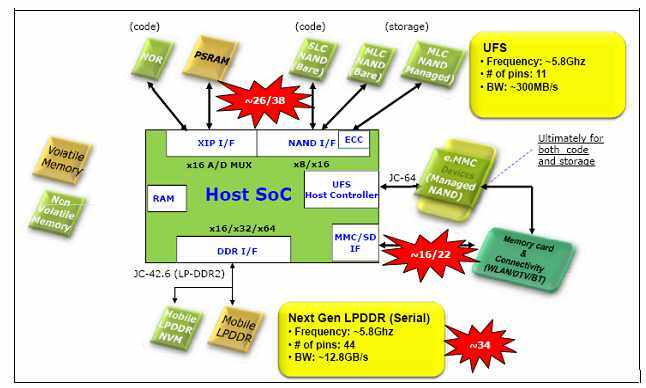 It uses only one MCP (multi-chip package) consists of 4Gb of Mobile DDR together with 4Gb of NAND storage memory. 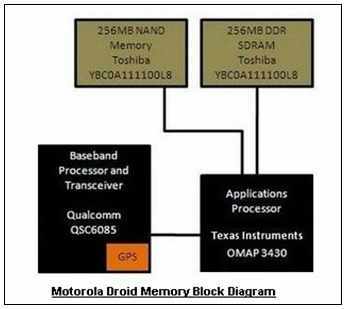 The Motorola Droid memory system includes 2 chips. It has 256MB of NAND. Another 256MB of SDRAM is physically hidden underneath the application processor. The Palm Pre Smart phone takes a different approach. It uses an Elpida LPDDR memory for fast operation. It also use 2 NAND chips for firmware and mass media storage. 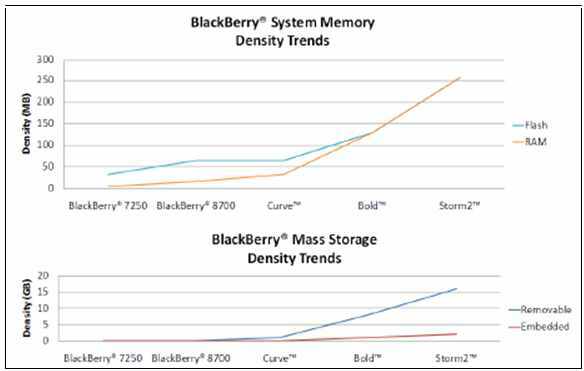 The Black Berry Storm is different in using only one MCP chip to host the entire memory system. It also use a plug-in memory card to provide mass storage. The MCP consists of NAND for storage, One NAND for firmware, plus Mobile DDR for fast operations. From all the cell phone memory system, the obvious trend is MCP. Multi-chip packaged memories will be necessary to save precious real state. Some systems choose to package DRAM with application processor based on the projection of future silicon embedded DRAM memory with the processor. Most of the systems choose to package DRAM with NAND to become one memory module and unified memory bus. Plugged-in managed NAND also make sense for flexible mass storage. With all these variations, mobile memory testing becomes a challenge. The DRAM plus CPU combo can be tested by activating the CPU to access the memory. It requires a test fixture with very few additional components. The tester is easily built by the factory test engineers. Stringent test patterns have to be used to make sure the non-volatile memories are free of soft failure and hard failures. Plugged-in managed NAND memories are easy to format and test also. Since they are managed by their smart controllers with standard interface, it can generally be tested using PC software and algorithm. There remains the DRAM plus Nand combo. The two types of memory chips usually share a common package but with separated pin out. Test can be performed with separated test fixtures constituting a two pass test. That means testing the DRAM and the Nand Flash separately. The better method is to use one tester that can be reconfigured from DRAM testing to Nand testing on the fly. This kind of tester is usually configured and customized specifically for the special MCP device. Paying attention to the smart phone applications, we can also learn the production tests required. Since DRAM on a cell phone is used for video buffer and dynamic activities, single cell soft failure can lead to system hang. It is, therefore, important to test every memory cell unit to ensure no soft failure, and cross cell contaminations. Many memory test patterns are designed for that. Since complex test patterns will take longer time for test. The manufacturer will have to determine the trade-off between quality assurance and test time. As the Nand Flash memories in a cell phone are for storage of multi-media, test requirements are generally less stringent. Besides, most Nand storage usually operated from a controller with error correction and wear averaging. The controller is designed to monitor the bad cells and automatically retire them when they are encountered. Nand testing in a mobile system is basically resorted to just simply Read/Write/Erase, bad block marking and good cell counts. Since Nand flash write and erase time is long, parallel test of multiple chips are preferred. Multi-chip test and burn-in system is most common.